When I met Mindy at a local wedding show, she was already planning her honeymoon to the Caribbean. I wished her luck in planning her wedding, and I did not expect to hear from her again. Several weeks later, I received a call from John, Mindy's fiancé. He explained that Mindy works a fast-paced, high-stress job and is on the road much of the time. 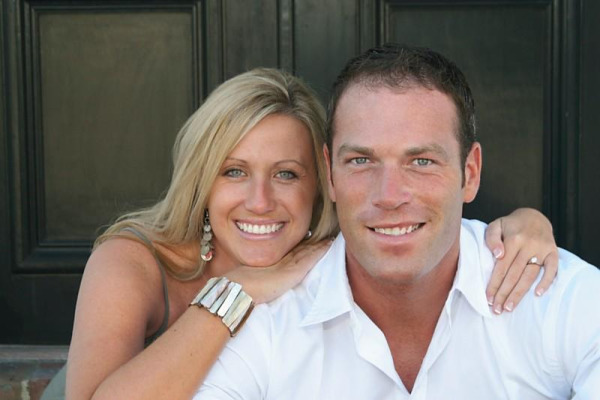 He is a small business owner, and they were overwhelmed by the whole wedding planning experience. They had decided to consider a destination wedding because they wanted a beautiful, intimate wedding, and they wanted the planning to be easy and stress-free. 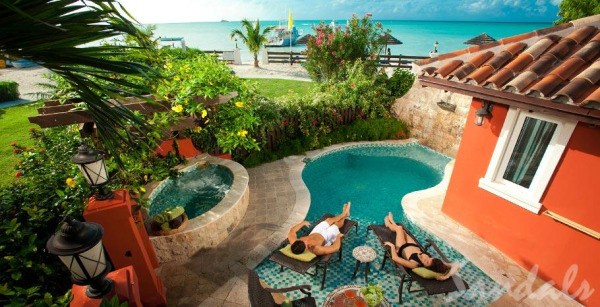 So I told John about the Sandals WeddingMoon® (destination wedding + honeymoon all in one package), and within a day or so we had planned their destination wedding and honeymoon at Sandals Grande Antigua. 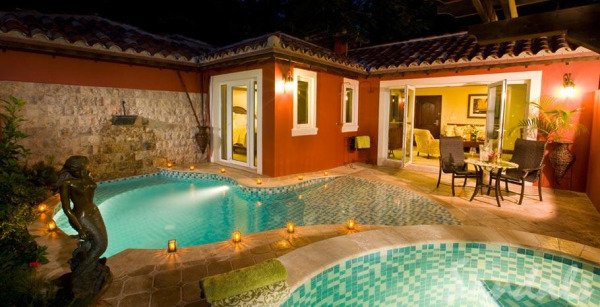 I always recommend that honeymooners - and especially those getting married on resort - book one of Sandals Love Nest Suites. 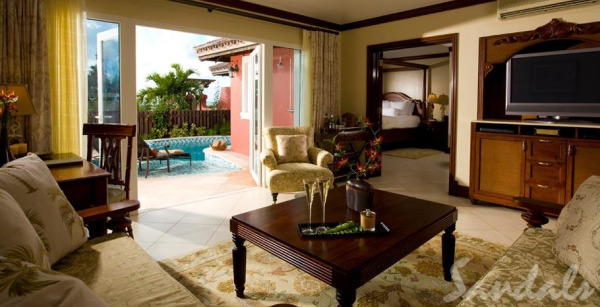 These suites are Sandals most romantic, intimate accommodations, and staying in a Love Nest Suite makes for a very special, unique honeymoon experience. 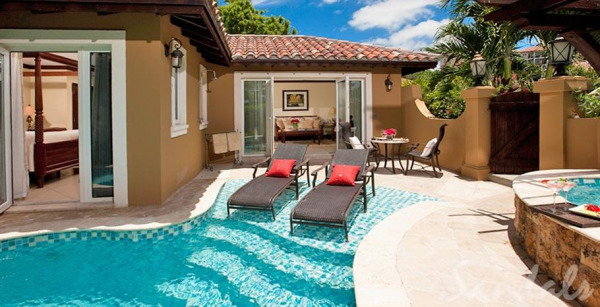 John and Mindy chose the Ultra Luxury Ocean Villa with Private Pool at Sandals Grande Antigua. Once their suite was booked, I scheduled their wedding for 11am on their third day on resort at Mindy's request. She wanted to get married as soon as possible and enjoy the honeymoon. We went over some of the custom wedding options, made sure the appropriate legal documents were received by Sandals wedding department, and the planning was complete! 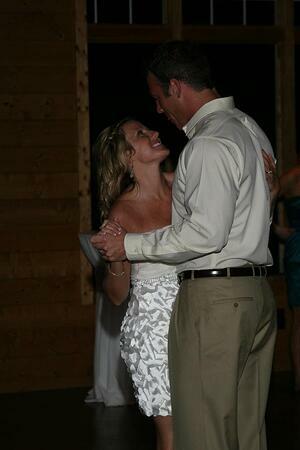 Mindy and John returned from their destination wedding two very happy clients - as I knew they would. 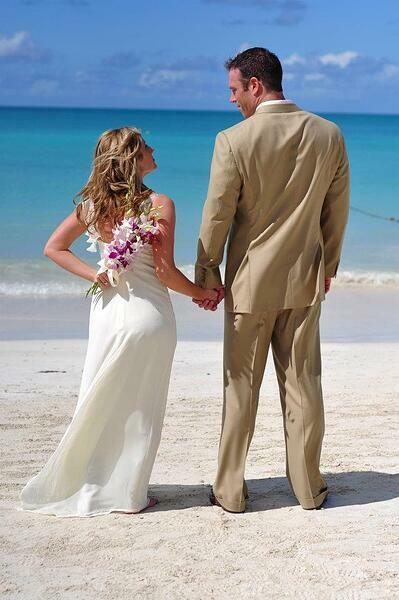 Sandals always takes such great care of my brides and grooms. The most common comment my clients make is that the service that the Sandals staff provided went far above and beyond their expectations. 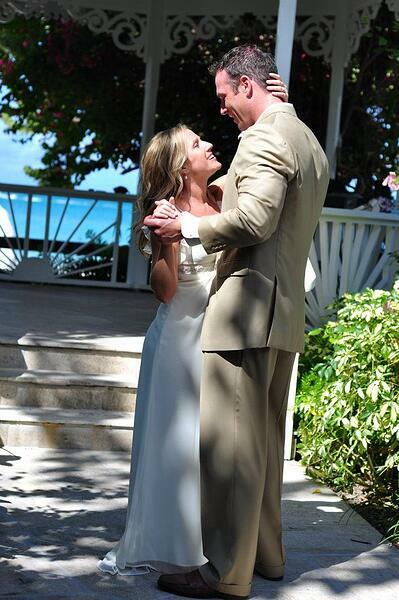 Below is Mindy's account of her experience with Sandals wedding staff. Mindy says that the wedding staff was absolutely fabulous, and that in some ways they were the best part of getting married at Sandals. As soon as the couple arrived on resort, two girls from the wedding department took them to the court house to fill out the remaining paper work. The wedding staff knew Mindy and John's travel schedule, made the appointment with the court house ahead of time, and had them back on resort in no time. Then, they had their official wedding planning appointment with the wedding staff. They went over many options and customizations for the wedding ceremony and reception. Mindy was able to select options that reflected her style. Last, the wedding staff took Mindy and John around the resort and made several suggestions for the location of the wedding ceremony. At each site, they showed pictures of past weddings so that Mindy could get an idea of what the area would look like when it was set up for a wedding and what her ceremony pictures would look like. Mindy and John chose a gazebo near the water so that the ocean would be in the background of their pictures. The next day, Mindy and John were able to hit the beach and relax knowing that all of their wedding planning was taken care of. When the wedding day came, one of the girls from the wedding staff came to help Mindy get into her dress and escorted her to the ceremony site. John spent the time before the ceremony with the clergyman who was to marry them. Mindy's assistant and the clergy worked together to make sure that Mindy and John did not see each other before she walked down the isle. The couple was very impressed with the clergy. He took time before the ceremony to get to know John and kept them smiling and comfortable during the ceremony. The two girls from the wedding department served as their witnesses to the marriage, and Mindy was touched that one of them cried during their vows. Mindy points to the fact that one of the wedding staff used Mindy and John's video camera to capture the ceremony for them as an example of how committed the staff was to making their wedding day perfect. Sandals does offer videography services through their wedding photography department, so this may not necessarily be an option for all couples, but it is a good example of the level of service that the wedding department provides. Mindy and John were also very impressed with their wedding photographer. After capturing the ceremony, he spent another 2 hours with them making portraits at different locations around the resort. 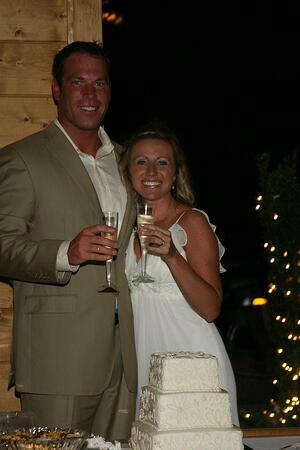 Mindy says that her destination wedding was perfect. She would not have changed a thing, and that Sandals wedding staff was wonderful. They were "Johnny on the spot" and made sure that everything was in order and went smoothly so that Mindy and John could enjoy every minute that they were on resort. The couple decided to have a wedding reception at home. They still got to eat, drink and dance with their friends and family. But Mindy laughs and says that planning the wedding and the honeymoon took 15 minutes (that's a slight underestimate) and planning the reception took forEVER. Mindy and John have several engaged couple-friends who are at various stages of the wedding planning process, and they say that they keep telling them… You should just go to Sandals! Thank you Mindy and John for sharing your special day with me. If you are interested in learning more about a Sandals destination wedding, please click below to request your complimentary destination wedding consultation.